A priori, there could only be four possible causes for an interference fringe shift in Michelson’s experiments: 1) the theoretical absolute displacement of the mirrors from the stationary ether and the light ray; 2) a change in the transmission velocity of light waves; 3) a change in the wave length and/or in the frequency of receipt of light waves; or 4) a change in the distance/time interval of propagation for one light pencil relative to the other. In order to completely solve the riddle of Michelson’s null results, one must first address the basic question: What could possibly cause an interference fringe (that is, the relative position of out-of-phase light waves of two light pencils propagating to and fro between relatively stationary mirrors in different perpendicular directions) to shift into a different relative out-of-phase position? This slight relative shift of out-of-phase light waves was the only thing that Michelson was trying to detect and measure. It turns out that there are only four possible theoretical causes for an interference fringe shift in Michelson’s experiments. We shall now separately explore each of them. A. The theoretical absolute in-tandem displacement of Michelson’s longitudinal mirror from the stationary ether and the longitudinal light pencil. In the last chapter we thoroughly discussed this theoretical possibility but found it to be an impossibility with respect to the stationary ether, empty space or even other relatively moving celestial bodies. Therefore, we shall remove these possibilities from further consideration. This still leaves the theoretical possibility that Michelson’s mirrors might have displaced from a light pencil, i.e. because of the motion of the Earth relative to the Sun. 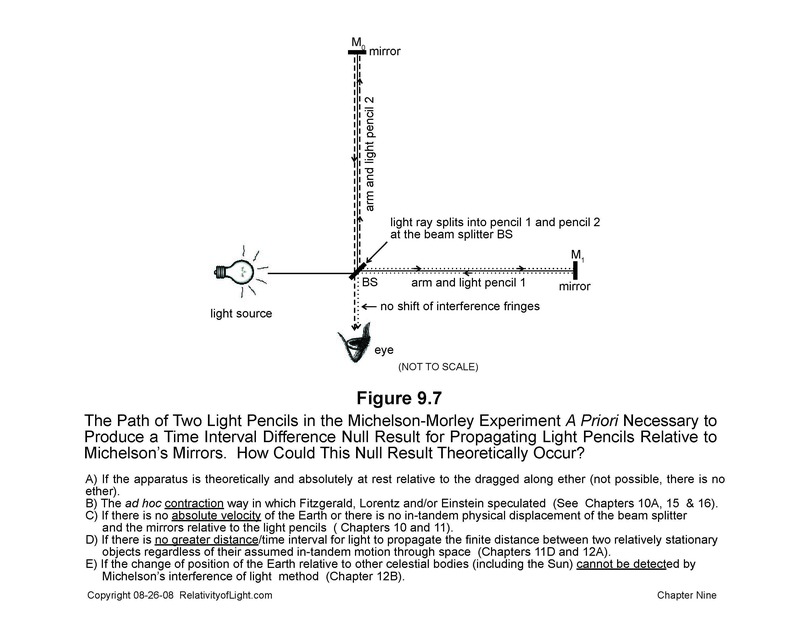 In other words, did the change of position of the Earth relative to the Sun during its solar orbit cause one light pencil to propagate a greater distance/time interval within Michelson’s apparatus? We will discuss and scrutinize this possibility in Section D of this chapter and in Chapter 12 to follow. We will also discuss a related possibility of displacement and a greater distance of propagation in Chapter 12. B. A fringe shift could be caused by a change in the transmission velocity of a light pencil. If each light pencil in Michelson’s experiments had sequentially passed through a different material medium (i.e. air and water respectively) in each direction of its propagation, then the greater refraction index of the light pencil through the denser medium (water) could have caused the transmission velocity of light waves (and thus the time interval of their propagation) to decrease in that direction. This could have caused the light pencils to be out-of phase, which, in turn, could have caused an interference fringe. When these out-of-phase light waves were rotated through 90 degrees, a priori this could have caused a shift of the fringe (Figure 11.1). 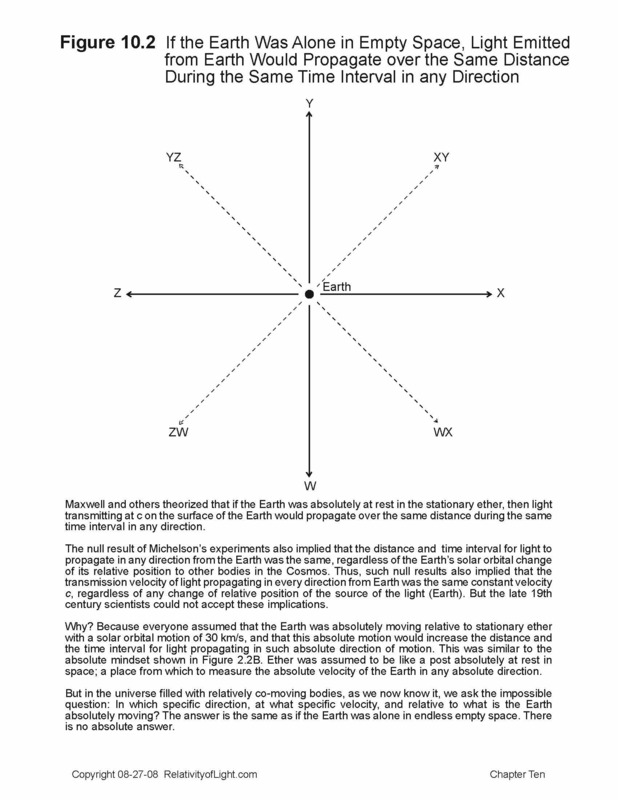 But, empirically the physical light medium in each direction of Michelson’s apparatus was the same…air. So, a change in transmission velocity, and thus a change in the time interval of propagation due to a possible different material medium in each direction, was not relevant to Michelson’s experiments. It could not be the reason for the paradox. If the material light medium in Michelson’s experiments had been stationary and then moving in one specific linear direction relative to the direction of light propagation (i.e. the moving water in Figure 11.2A), this might have caused a fringe shift as it did with moving water in the 1851 Experiment of Fizeau. 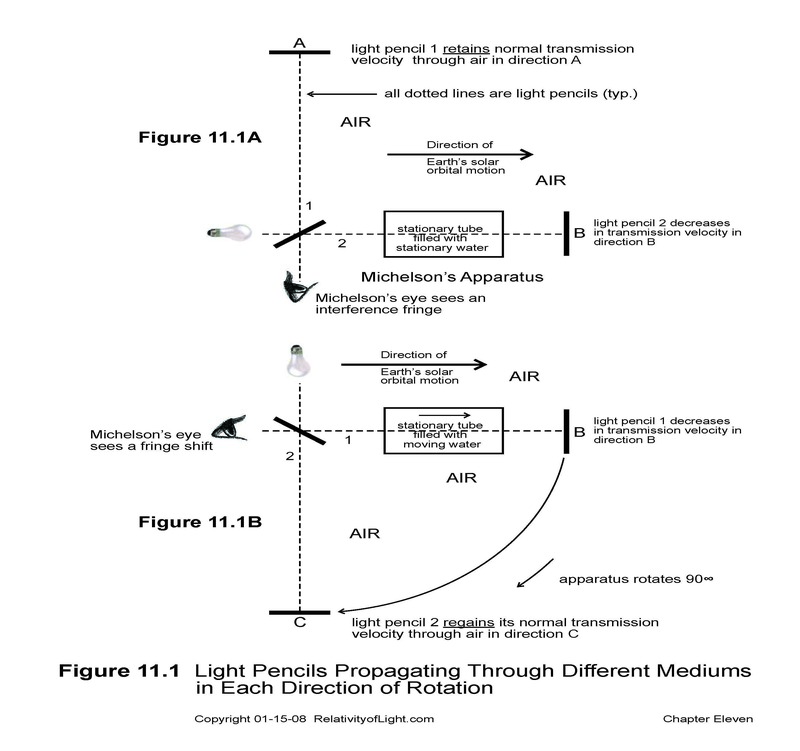 But, again, in Michelson’s experiment the material light medium (air) in each direction was not linearly moving relative to the propagation of any light pencil, so its possible motion could not be relevant to Michelson’s experiments. What was relevant about the Experiment of Fizeau was that in Fizeau’s experiment the moving medium (water) did cause the detection of an interference fringe shift proportional to the motion of the medium (water) in each opposite direction (Chapter 7 and Figure 11.2A). So empirically we know that some motion within the light paths of the experiment can cause an interference fringe shift. 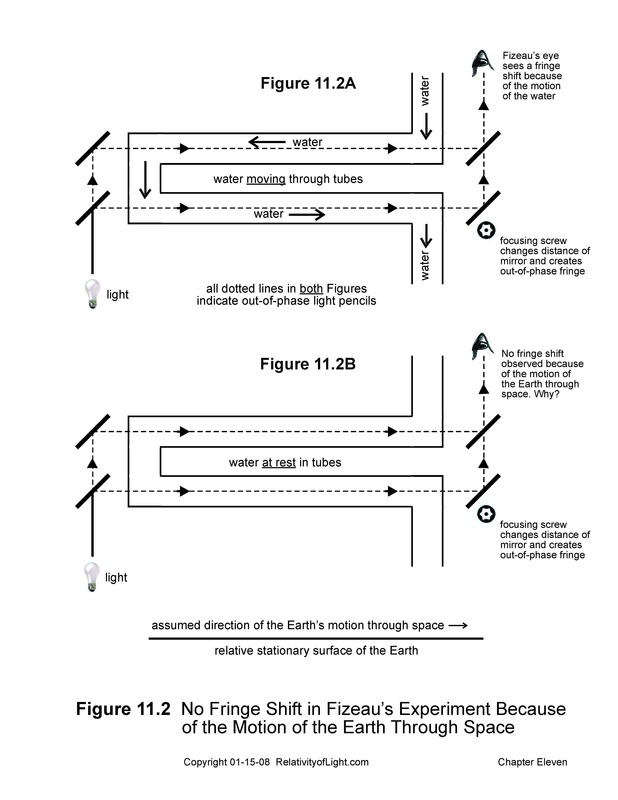 But when the water was at rest in Fizeau’s tubes relative to the surface of the Earth there was no detection of a fringe shift caused by any motion of the Earth through space, either because of the Earth’s rotational motion, or because of its solar orbital motion, or because of its galactic motion (Figure 11.2B). If a light ray must propagate further and for a greater time interval in the direction of the Earth’s absolute motion, as theorized by Maxwell, Michelson, Lorentz and Einstein, then a priori should not Fizeau have detected a fringe shift at some time during his experiment due to some motion of the Earth through space, when the light ray was propagating through the relatively stationary water in Fizeau’s experiment’s tube? Even though the water was relatively at rest vis-à-vis the surface of the Earth, it was still a priori moving with the surface of the Earth through space at v; theoretically a greater distance/time interval of light propagation. Yet no fringe shift was ever reported to be detected by Fizeau in this situation. Why? The empirical answer is obvious. There is no greater distance/time interval for light to propagate over the finite distance between two relatively stationary mirrors in the assumed direction of the Earth’s motion through space (Chapter 12A for details). C. A fringe shift could be caused by a change in light’s wavelength and/or by a change in the frequency of receipt of the light waves. Two light pencils propagating in space with the same color of light, and thus the same wavelength, automatically have the same frequency of wave receipt by a relatively stationary observer such as Michelson…even if they are out-of-phase. Thus, such identical wavelength and the identical frequency of wave receipt of two out-of-phase monochromatic light pencils cannot (by themselves) result in a shift of their observed relative state-of-phase. D. A fringe shift could be caused by a change in the distance/time interval of propagation for one light pencil relative to the other. We know that this conclusion is true, because empirically when Michelson slightly displaced one mirror from its light pencil (vis. 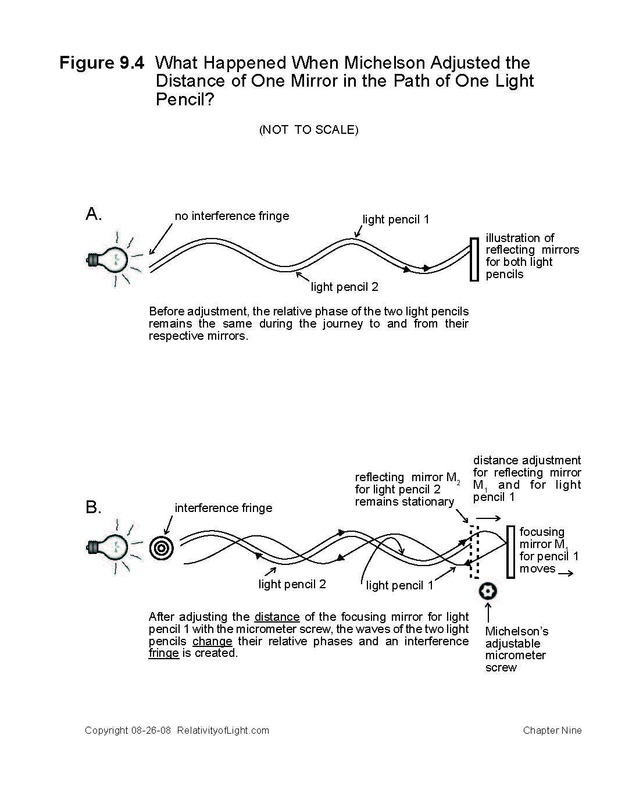 when he used the micrometer screw to adjust the distance of the focusing mirror to create an out-of-phase interference fringe) a change (shift) in the relative wave phase of the two light pencils was empirically observed and it resulted in an interference of light fringe (Figure 9.4). This was a physical displacement of Michelson’s focusing mirror from one light pencil. Thus, when we are able to observe such a physical displacement of matter (i.e. the different relative position of Michelson’s focusing mirror) within the light paths of the experiment, we know that one light pencil must propagate a different distance/time interval than the other, and that a change in the relative wave phase (a fringe shift) will be observed. But the theoretically implied displacement (an implied greater distance) of one reflecting mirror from one of the light pencils hypothetically caused by the absolute velocity v of the Earth with respect to stationary ether (or empty space) in a specific absolute direction (Figure 9.1B) was not empirically observed nor detected by Michelson’s apparatus. Why? Because the theories were wrong. The ether did not exist. A hypothetically greater distance/time interval from something that does not exist also does not exist. Therefore, empirically it cannot be observed, detected nor measured (Chapter 10). The question that we ask in this section is quite different. 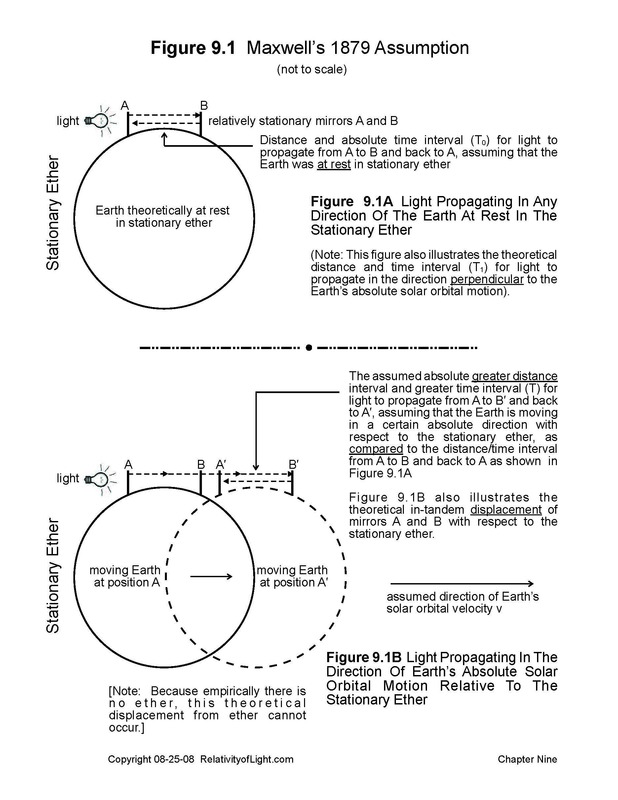 Specifically, we ask whether the solar orbital motion of the Earth (that is, the Earth’s constantly changing position relative to the Sun) could have caused the longitudinal light pencil in Michelson’s apparatus to propagate a greater distance/time interval to and fro between the relatively stationary beam splitter and a relatively stationary reflecting mirror in such solar orbital direction, as compared to the distance/time interval propagated by the transverse light pencil propagating in a direction perpendicular to such solar orbital change of position of the Earth? We shall explore and further answer this all-important question in Chapter 12A to follow. There is one thing, however, that could not cause a shift of the interference fringe in Michelson’s Experiments: that is where two light waves of equal wavelength propagate through the same medium and over the same finite distance during the same time interval. This factual scenario is exactly what the empirical ‘null result’ of Michelson’s experiments implied (Figures 9.7 and 10.2). Could this implied empirical result actually be correct, despite the overwhelming scientific mindset to the contrary? The answer to this question is also found in Chapter 12A.